Are you excited by this news? Are you appalled by this news? Are you angered by this news? Are you totally confused by this news because what’s “Answers in Genesis”? Whatever your reason for clicking through to my blog, welcome. I hope you find my posts on this organization and the linked resources helpful and informative as you prepare for the arrival of Ken Ham and his Fantastic Ark in the Great White North. Whether you are a churchgoing Christian like me, an atheist, agnostic, or come from an other faith tradition, you should become familiar with Answers in Genesis and the possible implications for its official arrival in Canada. What is Answers in Genesis and Why Should You Care? Or I Feel Like I’m Taking Crazy Pills! So, last time, I mentioned that a friend of mine posted my Part II of this series on a Facebook page called Evidence for Creation. At first, I watched the discussion unfold without commenting but against my better judgement I jumped into the fray. As with most internet exchanges, it did not end well. 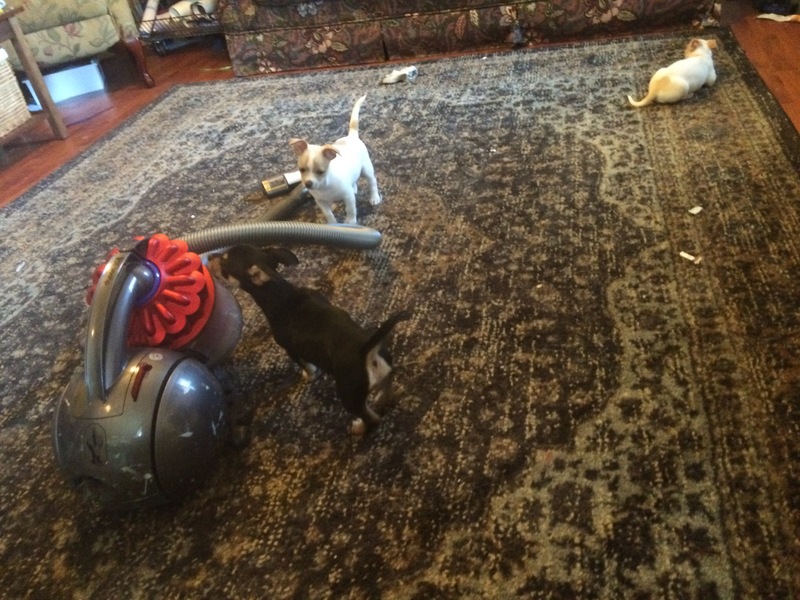 It barely started well. And I am certainly not innocent, here. I get a little frustrated after being on the defensive and arguing in circles for about 400 posts. My patience wears a little thin especially when someone suggests that I need still more education and really means that I need to read a particular scholar that agrees with them. Meanwhile, the majority of YEC contributors demonstrate a pervasive anti-intellectualism but I’m the one who needs yet another MA. We’ll get to this double-standard. What would be apparent to anyone (except the YEC contributors) to this thread would be that at almost every turn of the argument and with every new contributor they confirm the main thesis of my post. My argument is: Many YECists, in their endeavour to defend their commitments to their particular version of “biblical inerrancy”, their peculiar interpretation of Genesis 1, and their belief that the earth is less than 7,000 years old will frequently employ statements and make assertions and recapitulate arguments that were deemed heretical and unorthodox by the Church. Moreover, the traditionally orthodox position that I set forth is greeted as heretical. Additionally, I am frequently rebuked, my faith in and commitment to Christ is questioned, and, so, the question of my salvation is up for grabs (Christ’s grace is apparently not sufficient to cover my supposed doctrinal errors). Now, as they were responding to my post about Apollinarianism, it was not surprising that the main focus was what Jesus knew, how and when did he know it. Yet, time and again and in predictable circular fashion and as new people joined the thread (having read my post or not), the orthodox position that during the incarnation there were things Jesus did not know was rebuked as unbiblical and heretical and tantamount to denying Jesus’s divinity. A recent twitter exchange with a Young Earth Creationist (YECist) has been the source of inspiration for this series of posts providing me with examples of the resurgence of heretical arguments in an effort to defend YECism and their peculiar though popular way of interpreting the Bible. In the last post (tap here), I addressed the use of arguments akin to those of Bishop Apollinaris of Laodicaea in the fourth century. A friend of mine posted Part II to a YEC Facebook page and sure enough there was a strong reaction to the idea that during his incarnation Jesus set aside his omniscience. As my friend and I kept pointing out as we “dialogued,” many of the assertions that they made demonstrated my argument. In this post, and following the turn of this same twitter exchange that motivated the first post I review the Christological heresy known as Modalism or Sabellianism. In the previous post (click here), I noted that in on-line interactions with Young Earth Creationists (YECists) it is never long before the YECist questions my faith, often in a way that demonizes me, or on more than one occasion by suggesting that I am really an atheist in disguise (which for YECists amounts to pretty much the same thing). In their judgement, I am either deceived by the devil or a deceiver in league with the devil. There does not seem to be an available third option. Yet, what truly intrigues me is that these condemnations usually occur when I have asserted something in accord with orthodox Christian doctrine. Ironically, the counterclaim that YECists offer as a corrective rebuke to my orthodox asssertion is usually a blatantly heterodox or heretical statement. Over the past year, I have been openly critical of the teachings of Ken Ham and his organization Answers in Genesis. The more I attended to their teachings — beyond the obvious and overt commitment to Young Earth Creationism — the more I discovered that this fundamental commitment is bolstered and defended by a web of less obvious commitments. Many of these commitments are simply bizarre (i.e. Dragons in literature are evidence that human beings lived at the same time as dinosaurs) but others are outright heretical with respect to the traditional teachings of the Christian Churches. 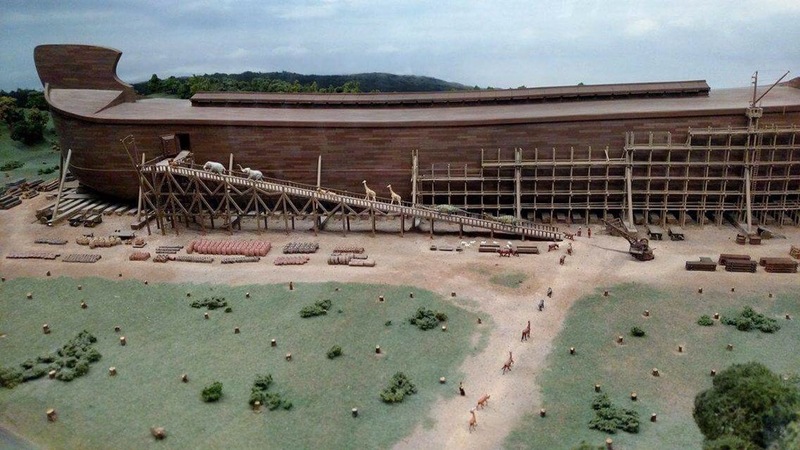 Ken Ham’s Ark has three decks which are divided thematically pre-flood, during the flood, and post-flood. Immediately before entering the Ark, a photographer directs the visitor to stand in front of a blue screen for a photo. In the gift shop, you can purchase a photo of yourself with Ark Encounter themed images in the background. Of course, Joel and I purchased our photos for posterity’s sake. Now, even in this first week, the Ark was not terribly busy. Had it been busier, I wondered at the logistics of stopping people for photos. This process seemed to have the potential for being a log jam in the future. A “gopher wood” log jam, of course. As I boarded the Ark, a virtual jungle of animal sounds filled the atmosphere. I found myself surrounded by small wooden cages stacked floor to ceiling. The calls and whistles of various birds, the chattering of small rodents, the yowling of cats, and even the hiss of snakes could be heard coming from the small cages. Cool!, I thought. Ham has stated that he wanted the Ark Encounter to be something akin to an exhibit that you might find at Disney or Universal. In this initial moment, I was reminded of the awesome transformation of sunny California afternoon to cool New Orleans evening on the Pirates of the Carribean ride at Disneyland. So far, Ken, not bad. Each cage had a clay feeder and water trough which would have been easily accessible to Noah and his family. The cages are spaced apart in such a way that feces can be gathered easily. 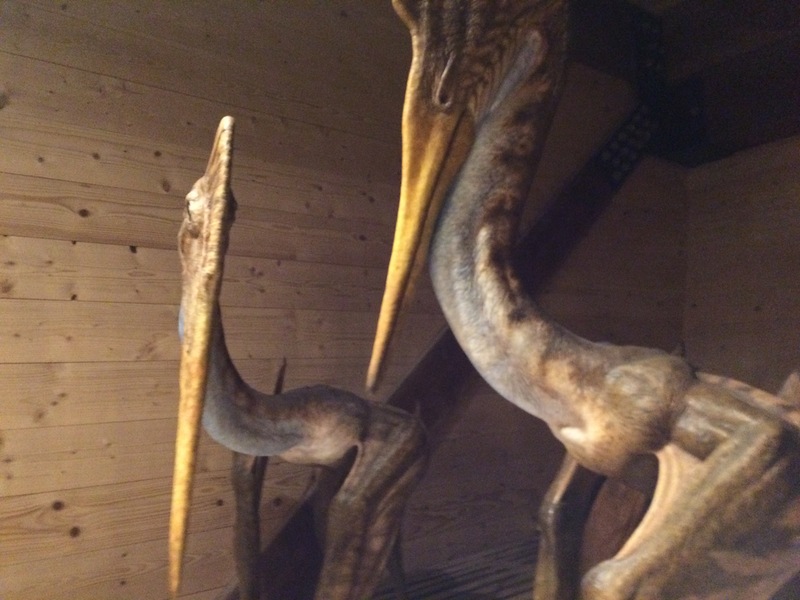 However, the cages were designed so that the visitor cannot see into them. The sounds suggest the presence of many small “animal kinds” that Ham posits were on Noah’s Ark. Okay, I thought, that’s not a bad way to save some money and still get a number of animals on the Ark. It was a cool effect and I was ready for more. 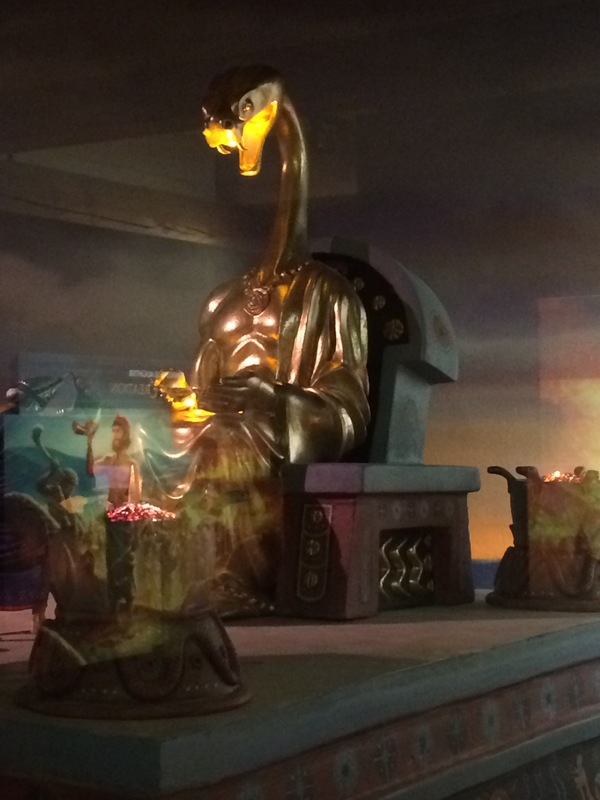 Keep in mind, as much as I am critical of Answers in Genesis, I was truly hoping that the exhibit itself would be like a ride at Disneyland maybe more Pirates than Star Wars but I wanted it to be genuinely entertaining. After all, Joel and I spent real money to see this thing. Yet, I came away disappointed because there were far fewer animals on Ham’s Ark than I anticipated and none of them were animatronic but that’s another deck. Wooden cages with wooden feeders and clay watering devices. The cages are designed so that you can’t see into them. It gives the illusion of many animals. Walls of clay jars that one can imagine carrying the various foods for the animals aboard the Ark. Like the small cages, the visitor will see pots lined floor to ceiling along the walls. These represent the food for the animals. Remember, they need a year’s supply of food for everything from rabbit-kind to velociraptor-kind. Wait, I guess they can feed the rabbit kittens to the velociraptor pups. On the lower deck, through a series of visuals mostly consisting of posters (often tedious to read), the visitor is told Ken Ham’s version of the biblical narrative from Creation to the Flood. It is a truncated version of Ham’s Creation Museum. I say Ken Ham’s version for as much as he claims to be offering a plain reading of the text his version includes many details that are not found in the text and, in my view, distort and distract from the meaning of the text. For instance, Ham’s version includes dinosaurs. I did not expect dinosaurs to play as large a role in Ham’s narrative as they do but there are dinosaurs around every corner. For instance, one will find dinosaurs in every portrayal of the paradisal Garden. But turn the corner and in illustrating the violence of humankind before the flood, Ham depicts human beings slaughtering triceratops for their horns much like modern humans slaughter rhinoceroses. In Ham’s theory, it is human activity of this type and post-diluvial environmental factors (like the one ice age) that wiped out the dinosaurs. I am truly baffled that Ham’s view of the dinosaurs is not enough to cause even some of the more credulous Christians to question Answers in Genesis’s ability to interpret historical data let alone be trusted to interpret scripture for them. There were very few animatronic displays far fewer than I would have imagined. In one of the displays, Noah’s hired workers (another eisegetical moment) are complaining about the work and describe Noah as a religious fanatic. Like the whole AIG narrative, this scene is more modern than ancient. If Noah was a historical figure and truly a monotheist and who in accordance with the later Mosaic law had no image of his deity among polytheists who worshipped images, then it is more likely that his contemporaries would have accused him of atheism and not being devoted enough to the gods. If there was a great flood coming, then maybe it was because Noah and his family had ticked off the gods by not worshipping them properly (see Job’s friends). As the other extant flood narratives suggest, it did not take much to annoy a god to the point of mass extermination. In one narrative, human beings are just to noisy and the gods can’t sleep. Anyway, his contemporaries would not scoff at the idea of a god causing a natural disaster. Rather, they would ask which god and likely try to appease them all just in case. Yet, despite Ham’s claims to the contrary, he and the folks at AIG are not interested in historical accuracy but in the us vs. them narrative of the culture war. So, Noah begins to look a lot like Ken Ham and Noah’s critics begin to sound a great deal like the New Atheists (and frankly like anyone who is critical of AIG teaching). The fate of these scoffers is as follows. Now, I will say that I enjoyed the detailed miniatures more than anything else in the exhibit. There is something about looking at a scale model world and a scale model Ark that is fascinating like a good detailed model train set. So, to end on a positive note, here are some of the images from the lower deck. Notice Ken Ham’s inconsistency. Here he clearly has the modern giraffe and not his hypothetical notagirafficorn. Princess Leia has a cameo. In Part I, I paid tribute to Ken Ham’s 4,000 space parking lot which has yet to fill to capacity. Today, Joel Anderson and I visited Ken Ham’s Ark Encounter and Creation Museum. This post is simply a brief post to commemorate this momentous occasion. After writing about Answers in Genesis for the past year, Joel and I thought it would be kind of sort of fun to see the Ark for ourselves. 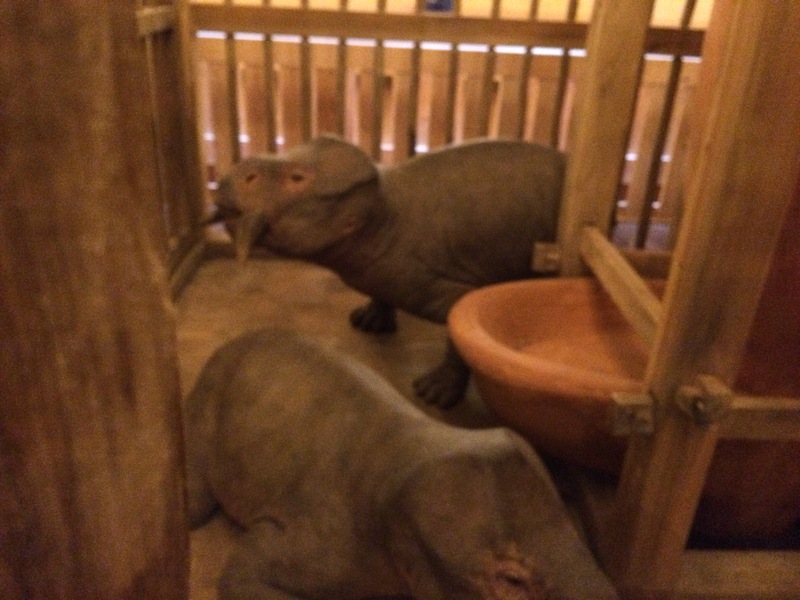 Of course, there were no real surprises at the Ark Encounter. Ken Ham and the folks at AIG have a limited number of points to make but I thought this spectacle would present this information in more detail and best light. 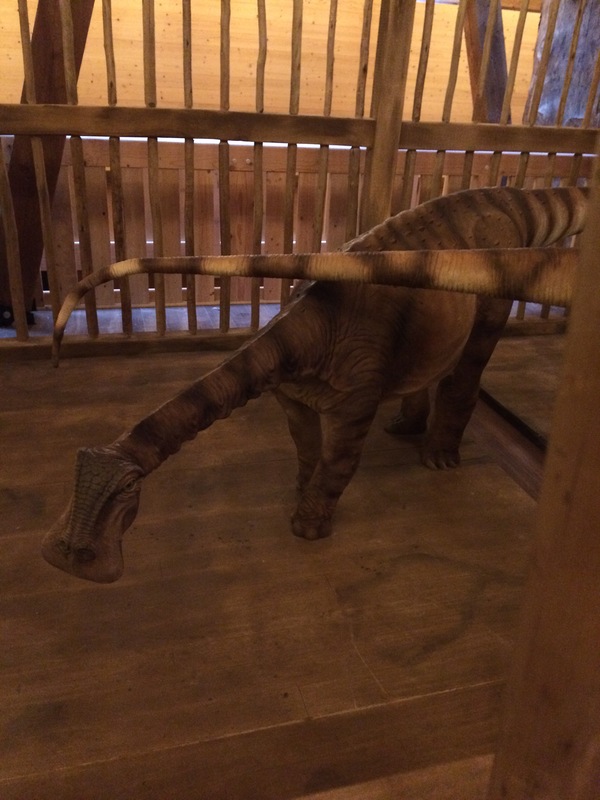 In the next few posts, I’ll walk you through what you’ll find as you go through Ken Ham’s exhibits. The Ark itself is an impressive sight. Both Joel and I walked away feeling that if these were simply imaginative representations of biblical narratives, then much of what is portrayed in these exhibits would be of some value. However, every moment of these exhibits is geared toward the bizarre and frankly unbiblical claims of Ken Ham and his organization. At least, Ken Ham points to the true origins of his teaching. 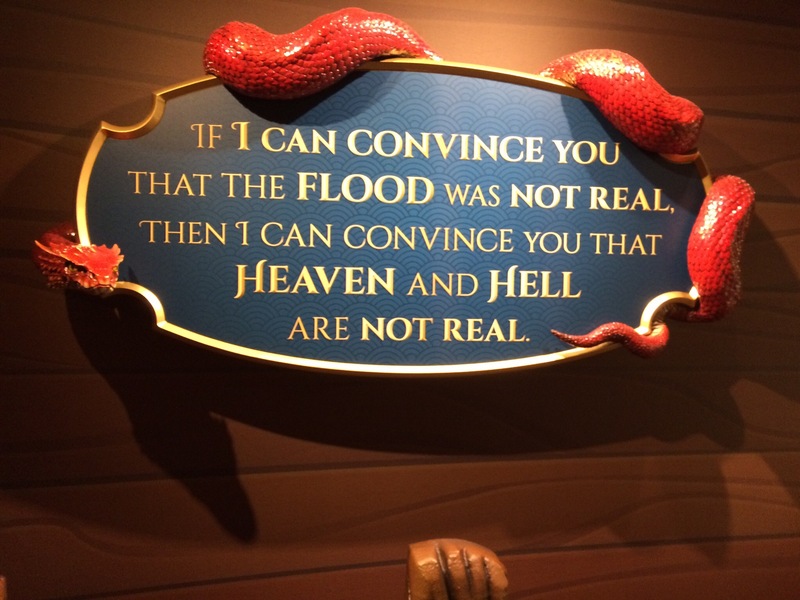 In the portion of the Creation Museum dedicated to the history of the organization, Ken Ham tells how “God” in 1974 led him to Henry Morris’s book The Genesis Flood. In my view, The Genesis Flood is Ken Ham’s Book of Mormon or Course in Miracles or Science and Health with Key to the Scriptures. One day, I might take the opportunity to visit the Mormon Tabernacle in Salt Lake City and I suspect I will feel the same as I did at Ken Ham’s exhibits, a curious outsider, interested in the history and influence of the organization but in fundamental disagreement with the unorthodox doctrines that arose in the nineteenth century. Ken Ham’s Young Earth Creationism is more akin to other nineteenth century new religious movements like The Church of the Latter Day Saints, Creation Science, and Jehovah’s Witnesses than it is to historical orthodox Christianity. 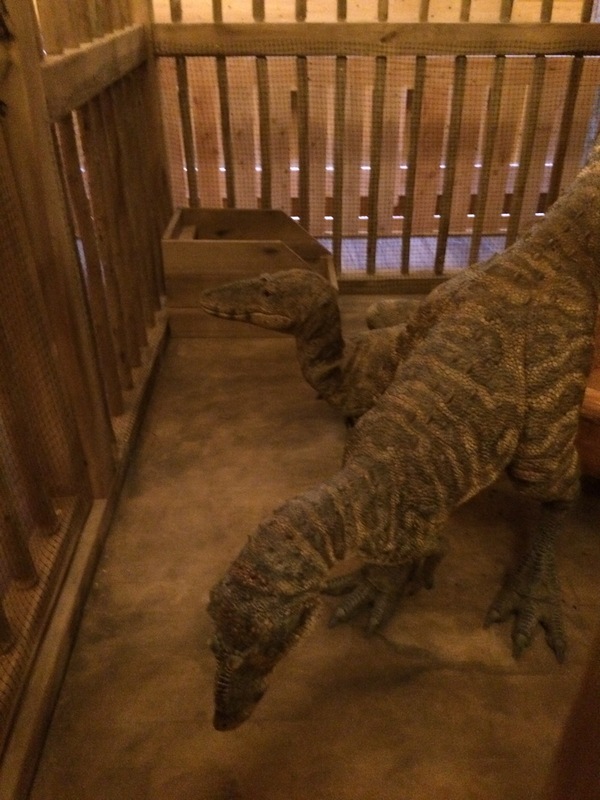 This post is a follow-up to my recent post Ken Ham’s Ark Encounter is Fantastic! In that post, I note the Double-Standard of Answers in Genesis when it comes to depicting the Ark. They chastise illustrators of books for children for their inaccuracies (as defined by AIG) but in their own advertising and practices they do not live up to their own standards. 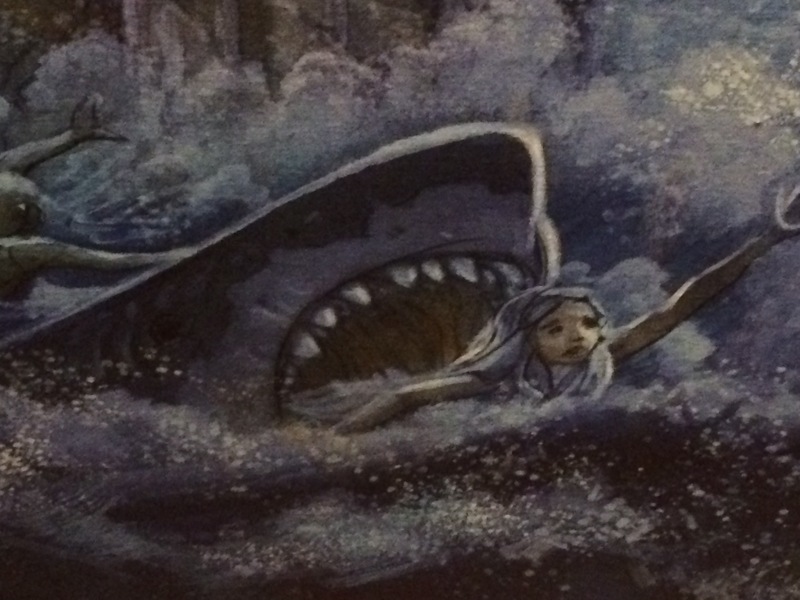 A Tweet brought another Ken Ham approved message on the dangers that lurk between the covers and frequently on the covers of children’s books and Bibles. In a post on the ArkEncouter.com, Ham reveals that the Ark Encounter will dedicate a whole wall to “Fairy Tale Arks” and the 7Ds of Deception. Next thing you know, he will be insisting that David wasn’t really an Asparagus and Goliath was not a Giant Pickle. Tantalizingly, Ken Ham only reveals three of the 7Ds of Deception in this post. I can’t wait to visit the Ark Encounter and find out the other four. At $40 a ticket, that’s only $10 per D. A bargain by any post-diluvian standard. 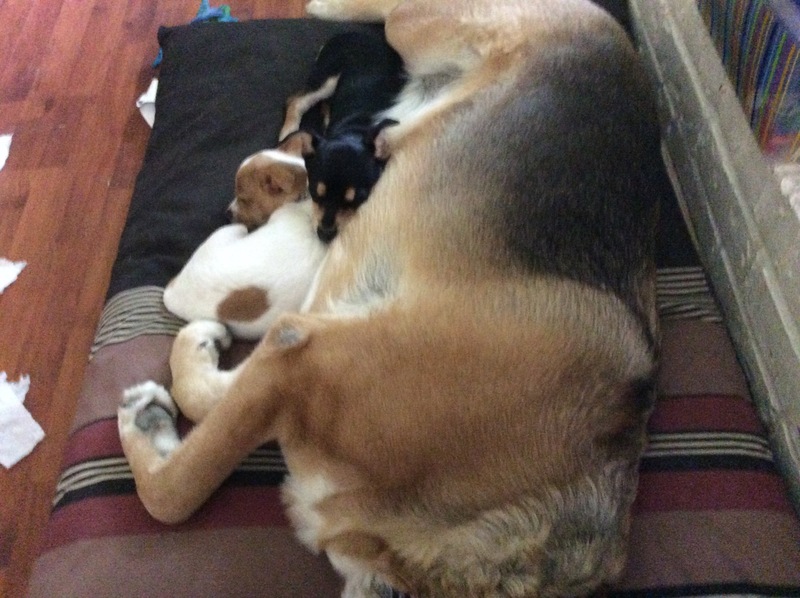 IP — Follow the link below to Joel Duff’s blog post at the end of this post. His recent post resonates with my recent post about Ken Ham’s Fantastic Voyage — Ken Ham’s Ark Encounter is Fantastic! In that post, I recommend going to the zoo instead. Dr. Duff inspired me to actually compare prices of places that we might go instead of the Ark Encounter or the Creation Museum.